Experience the brightest shade of white. Chemical Guys White is the world’s most advanced wax formula specifically designed for white and light colored paintwork. The innovative wax enhances the shine of white paintwork for a brilliant finish. Harmful UV solar rays can cause yellowing and discoloration to your vehicle’s white color. Chemical Guys White is engineered using advanced UV protective polymers to preserve the clarity and color of your vehicle. Chemical Guys White utilizes our patented Color Enhancing Technology which magnifies the natural beauty of your paintwork for a vibrant shine with optical clarity. Our innovative White gently cleanses the paintwork while removing light stains, contamination, and yellowing to enhance brightness. White will reveal the brightest shade of white that will truly impress any detailing enthusiast. Chemical Guys White is an innovative wax designed to enhance and protect white colored paintwork. Utilizing our patented Color Enhancing Technology, White creates a brilliant shine while providing durable protection against the elements. White is formulated using a specialized blend of synthetic wax and super polymers to create a brilliant shine with superior clarity. The secret to creating maximum depth and clear reflections is the high-tech synthetic formula designed to enhance white colored paintwork. White colored vehicles are easily stained by water spots, industrial contamination, and pollution. Over several years, harmful UV solar rays can cause discoloration and yellowing of your white paintwork. Chemical Guys White creates a protective shield that helps prevent discoloration and fading of your paintwork using advanced UV protective polymers. Chemical Guys White cleanses light colored paintwork to remove light stains and contamination to reveal the brightest shade of white. 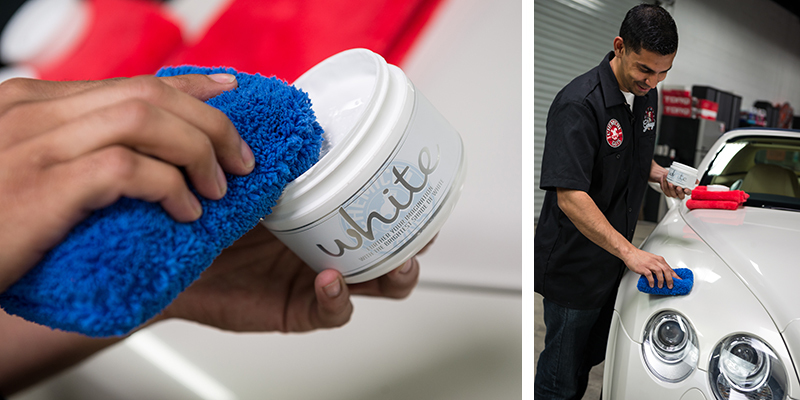 Chemical Guys White applies easily by hand or machine to create a bright shine that protects your vehicle’s finish. Chemical Guys advanced micro-cleansing formulation refines your paintwork for an even finish on all light color vehicles. Experience the brightest shade of white with Chemical Guys White. Chemical Guys White is a brilliant combination of natural carnauba wax, synthetic sealant technology, and gloss enhancers that produces the perfect wax for white paintwork. The innovative technology engineered into White Wax produces amazing reflections with perfect optical clarity. All vehicles over time with all the elements from our surroundings attach to the vehicle and its paintwork creating impurities in the paint. White colored vehicles especially show all these impurities. With the innovative technology in White, we created a formula of light paintwork cleansers so that it could protect, shine and cleanse all in one step. Although washing the vehicle or going a step further by providing a clay bar treatment, will remove all impurities and contamination, Chemical Guys White will provide that triple protection in ensuring only the brightest shade of white is revealed. Chemical Guys developed Color Enhancing Technology® to expand the clarity of automotive paintwork. This advanced formula allows the true color tone of your vehicle to shine in any situation. The unique technology magnifies the appearance of the paintwork for a true high definition color experience. Chemical Guys formulated White to enhance White paintwork to shine at all hours of the day. 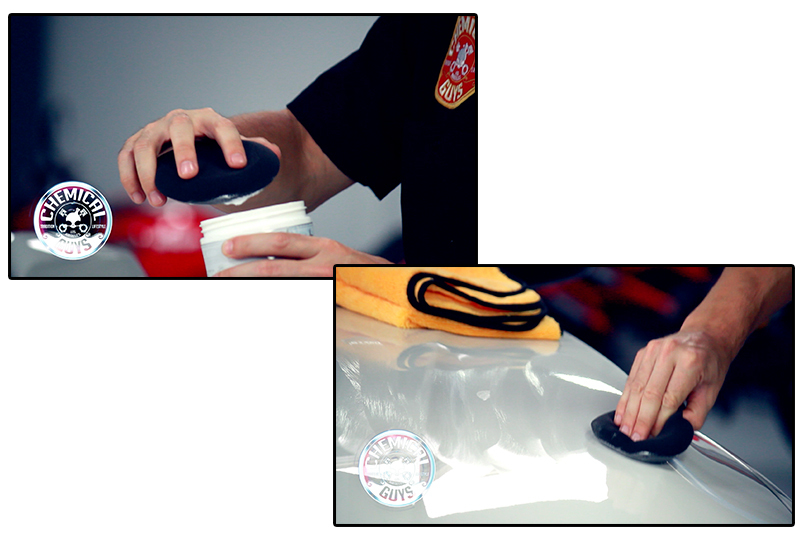 White turns waxing your car, truck, or motorcycle into an out of this world experience. The high-gloss finish of White really attracts attention by reflecting light in a unique way. White is sure to impress all the car show judges giving your paintwork an appearance that any car enthusiasts can appreciate. Chemical Guys uses the highest level of technology to give detailing professionals and enthusiast the greatest car care experience possible. 21st century UV blocking agents prevent aging and yellowing of your white colored paintwork. 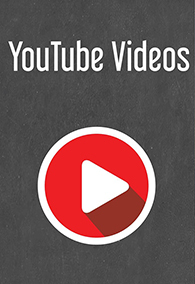 White is easy to use and can be applied by hand or machine for ultimate versatility. Simply apply a thin coat of White to the surface and allow the wax to dry on the paintwork. After a 20 minute dry time, easily buff off White to expose a perfect finish. White has multi-corrective capabilities that are designed to cleanse, protect, and enhance white colored paintwork. White is the perfect choice for any white or light colored cars, trucks, motorcycles, and RVs to produce the brightest shade of white. White is the world’s most popular color for vehicles today. More people purchase white colored vehicles than any other color. 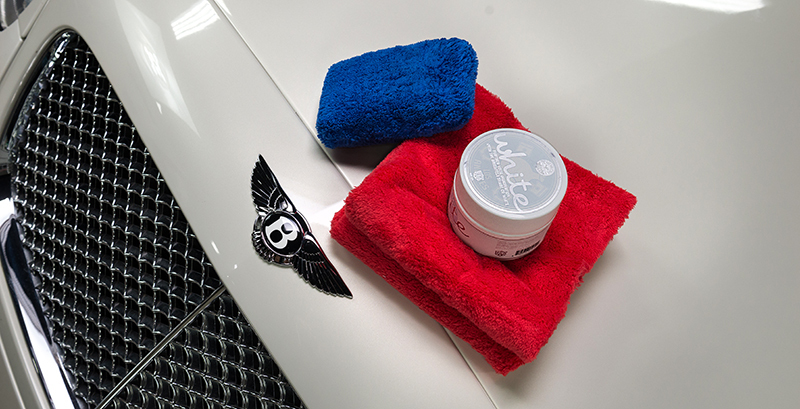 Chemical Guys White is the perfect solution to enhance and protect your bright white paintwork. We designed White to provide durable protection to your vehicle using advanced protection polymers. Chemical Guys White protects your vehicle’s finish against water spots, pollution, road tar, tree sap and other contaminants that can stain your paintwork. One coat of Chemical Guys White protects and enhances shine for months. White is easy to use, refines the surfaces, and provides a high gloss shine that defines the term “brilliant!” Discover the true brightness of white with Chemical Guys White.